Axios has reviewed a Grand Jury subpoena that Robert Mueller’s team sent to a witness last month. What Mueller is asking for: Mueller is subpoenaing all communications — meaning emails, texts, handwritten notes, etc. … The subpoena asks for all communications from November 1, 2015, to the present. The subpoena identifies ten people, including Donald Trump, who comprised the core group of the Trump campaign. What happened next makes me glad that I do not have any time to watch cable news during the day. The anonymous witness turned out to be Sam Nunberg, an early aid to the Trump campaign and a protegé of Roger Stone, who was fired from the campaign for racist posts on social media. To describe this guy as a “character” is a gross understatement. This guy is a headcase. And he apparently was having a meltdown on Monday. Here’s what it was: A sad, epic meltdown — a troubled Trump flunky, pecked at and picked apart like roadkill on the Russia Interstate, in his last gasps of public fame and shame. In a cry for help, Nunberg kept trying to top himself, giving longer and longer interviews (including a call-in to cable’s NY1 in New York!). Nunberg provided the subpoena anonymously to Jonathan Swan over the weekend, then gave it on the record to the N.Y. Times’ Maggie Haberman, then waved the wrinkled subpoena on-air with MSNBC’s Ari Melber, with a close-up shown on air. Shades of O.J. Simpson’s white Bronco L.A. freeway chase by news helicopters. The media loves watching a slow-motion train wreck — and so do Americans. This bit of political theater was the top trending story on Monday. Aaron Blake at the Washington Post attempts to explain What on earth was Sam Nunberg doing? A few theories. If there’s one key piece of the puzzle when it comes to explaining the mess that was Monday, it might well have been this: Sam Nunberg is not just some random political operative; he’s a close ally of Roger Stone. And indeed, Nunberg did little to suggest Monday that this wasn’t some Stone-orchestrated scene. He repeatedly talked about how he felt Mueller was targeting Stone for alleged collusion with WikiLeaks, and he repeatedly argued that Stone was innocent. Despite plenty of inconsistencies in his appearances, this was one point he kept coming back to. But even if you grant that this was all some contrived spectacle to assist Stone in some way, that still doesn’t answer how. Refusing to assist Mueller would seem to be help enough; why go on a media blitz saying all kinds of bizarre things? Perhaps this was just performance art for performance art’s sake. In one of Nunberg’s later interviews, with CNN’s Erin Burnett, Burnett asked him a question that might have otherwise seemed off-base: Are you drunk? In fact, Burnett didn’t just ask; she said she smelled alcohol on his breath. Even separate from that question, though, it was clear Nunberg was under plenty of pressure. That tends to be the case when you’ve got jail time hanging over your head for ignoring a subpoena. We all react to stress differently. Perhaps Nunberg, who was known for being very freewheeling and open with the media, simply started talking and couldn’t stop himself. Maybe he found himself in a tough spot and his first reaction was to try to talk his way out of it. Nunberg’s relationship with Trump is nothing if not complicated. As CNN recaps, Trump has fired him, rehired him, fired him again and sued him for $10 million before the two of them settled a lawsuit over Nunberg’s alleged breach of their nondisclosure agreement. The White House has also been dismissive of Nunberg whenever he has occasionally offered comments it didn’t like. If Nunberg really does harbor such resentment toward Trump, maybe publicly speculating about Trump having had an arrangement with Russia and having known about the Trump Tower meeting is one final piece of revenge. Coming from someone who has been interviewed by Mueller’s team, that certainly carries some weight. Maybe he wanted to suggest Trump had done something wrong while sounding like he was defending him. Or maybe, like former chief White House strategist Stephen K. Bannon, Nunberg is truly frustrated by what Trump has done — including to him — and couldn’t help himself. And maybe he even felt that Trump needed some kind of bat-signal delivered through cable news about how much trouble he’s in. 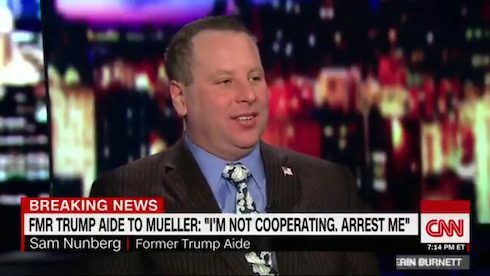 Sam Nunberg is just a distraction. In the end he is going to cooperate with the Special Counsel, he has no choice. And cable news can go back to doing its L.A. freeway chases.